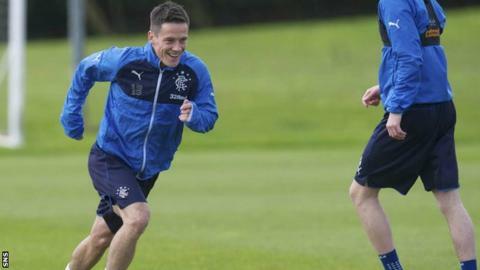 Ian Black admits he is seen as a villain in Scottish football, a tag he believes has been harshly attributed. He'll perhaps be most remembered as the first Scottish footballer to be punished for breaching gambling rules. His story has far more depth, from on-field success to disciplinary issues, to being booed by home fans in his only appearance for Scotland. "For me, I went on and I was noticed," Black told BBC Radio Scotland's Sportsound. "I played for my country and I was noticed above everybody else on that park because I was booed. "I'll take that as an honour. They knew I was there representing my country and there's a lot of people that won't get that opportunity. "[I] went out, done my job, won trophies, played for my country. "People can hate me all they want. Everybody hates me on the pitch. They meet me off the pitch and can't believe the guy I am." His combative, aggressive style didn't endear Black to opposition fans nor it seems referees as his disciplinary record demonstrates. However, Black believes his reputation went before him and he was targeted as a result. "I did get a picture painted that I was this villain," he explained. "A lot of it was harsh. I was a winner. "I'll never forget the tackle Ian Murray did on me at Tynecastle [in 2011], the elbow. If that was me I'd have probably got an eight-game ban for assault. He only got booked. "Teams would obviously be told, 'wind him up'. I take it as a compliment. I was a target because I could play and dictate games and make a fool of the opposition. "There was a few harsh bookings. Certain referees, they know who they are." What is not well known is how close Black came to signing for Hibernian before his boyhood heroes Hearts came in at the last minute to take him to Tynecastle. "I was actually at Hibs' new training ground with my agent having a medical there," he said. "Everything was going smoothly and the deal was just to be finalised. "Just as I was leaving, I got the phone call saying, 'you need to be up at Tynecastle'. "My eyes lit up. I don't think there was any turning it down." Black cites his spell at Hearts as the most productive of his career. He won the 2012 Scottish Cup, his final game for the club, memorably defeating Hibs 5-1 in the final. It is a result he ranks as one of the greatest ever achieved by the Tynecastle club. "Yeah, 100%," he explained. "I wouldn't say the whole XI but he would dictate who was playing, some individuals. "Once we were playing Rangers away. Club captain Marius Zaliukas was on the bus ready to go and got told to get off because he had a sore back. "You're telling me the manager decided that? I don't believe that for a minute." Off the pitch, Black began to generate headlines. He was arrested and charged with possession of cocaine in a nightclub, a case which was ultimately dropped. "It's water under the bridge," he said. "Done and dusted. I proved people wrong. "Hearts, my club at the time, demanded that I supplied a drugs test knowing that drugs are in your system for a number of days. "I did that within 24 hours, passed the drug test, court case thrown out and that's as far as it goes." His next move was a free transfer to Rangers, who were about to embark on life in the then Third Division. "Hearts to me are one of the biggest teams in Britain," Black explained. "Then you've got Rangers and Celtic. Everybody that knows football understands that these two are the biggest clubs. "You only get opportunities like that once, twice if you're lucky. "I just wanted to go and play for a club like that. I know they got demoted but we were still taking in 40,000 [fans] every home game. "I never went there for money. I had two or three options in England on the same money and could've went there. I went there and had a great time." In September 2013, Black was found to have breached betting rules and received a £7,500 fine and 10-match suspension, with seven games of the ban suspended. He insists he did not have a gambling problem. Black maintains gambling remains "rife" in Scottish football and that football authorities should not accept sponsorship from gambling companies. At Rangers, Black was a regular under Ally McCoist but was left out of the starting line-up when Stuart McCall took over as manager and left the club in 2015. "I do believe it was people behind the scenes who wanted me out," Black explained. "The training that he put on was probably the best I've had. As an individual he obviously didn't fancy me. "I've played against him since and he couldn't even look at the path I was walking. He's obviously got a sore point there for whatever reason. "Credit to him, he's doing a good job. I don't hold grudges but I thought he was a bit harsh." The former Inverness Caledonian Thistle midfielder moved on to spells at Shrewsbury Town and Blackpool and more recently Black has returned to one of his early clubs, Tranent Juniors. "They want to win things and I want to win with them," Black enthused. "The ambition of the club and what they want to achieve was enough for me. "I've had a successful career. There has been ups and downs." And he has a message for those that scream at him during games and continue to cast him as a villain. "Keep on screaming because I'm enjoying it and I'll just keep on winning," Black said.